How did you train that!?! Notice how the bird is leaning into the towel by his choice waiting for the towel to be wrapped around him. Pre training for a vet visit. Training is so much more than tricks. Positive reinforcement training is what you do when you need to change negative behavior issues our parrots display into positive behavior experiences from both them and for us. It’s about getting your bird to do behaviors you need them to do when you request them and making it rewarding for them such as stepping up onto a hand, accepting being toweled, offering a toe for a nail trim, going back into the cage when it’s time to go in. 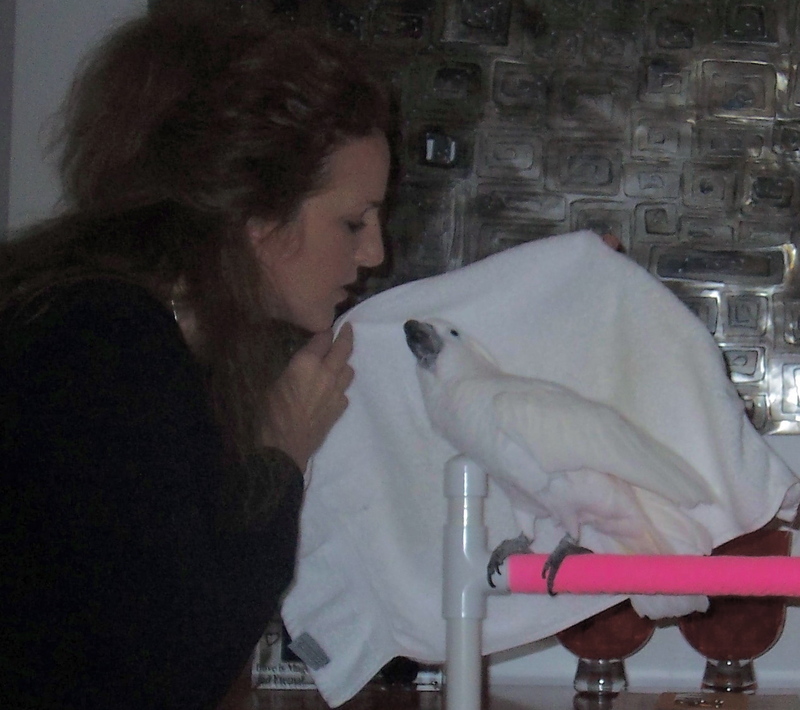 Positive reinforcement training helps build and re build relationships between parrot and owner that once was or never was. Do you envy the bird owner who has well behaved parrots? Come and learn how they do it and how they keep them that way. Let’s discuss how we unknowingly train negative behaviors also such as screaming , biting, or chasing. The negative behaviors can be easily trained and often trained very, very well. Find out how to teach your parrot to station. What is ‘stationing’? Stationing is having your bird go to a desired spot and stay there. 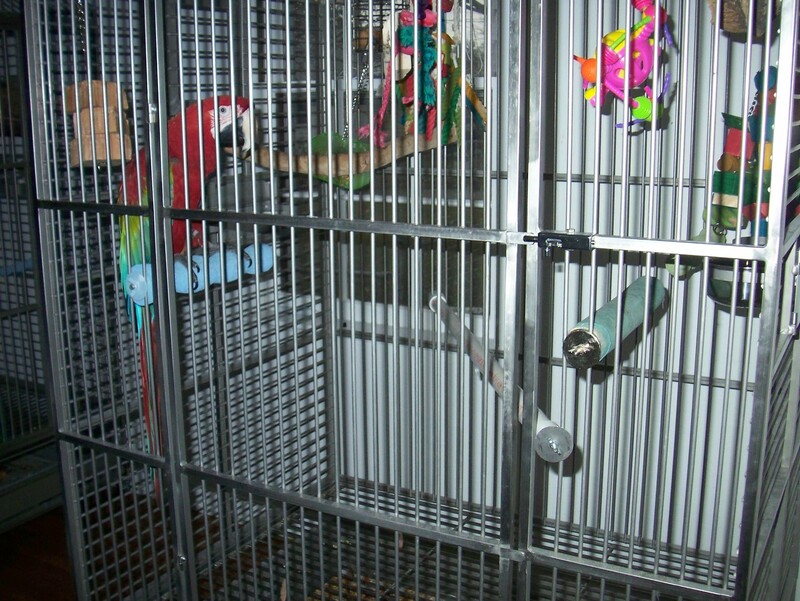 This comes in handy when you need a bird to perch and stay perched away from the cage door while you switch a toy. This comes in handy in living with flighted birds too. Cue your bird to stay in one spot until you come back into the room. Find out how to signal your bird to fly to your hand when you ask him to. This video is of Sarah Volk training her Budgie, Ricky to fly to her hand on cue. Keep in mind while watching this video that Ricky was once afraid of hands. Watch the video and see the power of positive reinforcement training. Bring your questions, concerns, successes, and experiences. Let’s all sit down and learn from each other. You don’t think something can be trained? Bring it to the group, I bet we may have suggestions. Want to hear something even more exciting? Some of the tactics you use to train your bird can be used on your dog, your cat, and your family members. Murray stationing on a requested perch until the cage door can be opened and asked to 'step up'. Come join the fun this coming Monday, May the 10th at 6:15 at The Sanger Branch Library on Central Avenue. We will be discussing some work being done behind the scenes and also be judging toys for the foraging toy contest. If you haven’t submitted a photo to us, please do so at parrotsocietyofnwohio@gmail.com. The winner will receive a gift certificate for $50 worth of parrot toys from Bird Toys by Lara Joseph. You now have 5 days left. See you Monday. We can’t wait.